Featuring a photo of a shoe being shaped on the anvil, #BC42 is an attractive, appropriate card for all styles of farriery. Submit your custom info in the box above and you'll receive a proof via email to review and approve before your card goes to print. "You never get a second chance to make a first impression." The old saying is still true. Make sure your card stands out from the rest with these full color logos designed especially for horse professionals. Your business card should be more than just a way to contact you. It needs to tell a little more about you; perhaps that you're serious about your work and belong to a trade association, or that you're qualified and willing to take on corrective or therapeutic work, or that you do equine dentistry, or horse training or welding or ironwork also. The back of the card can state your policies on billing, schedule subsequent appointments, or feature an interesting or humorous quote that can reflect your beliefs or values. Don't let your business card be just a paper with your name and phone number, it represents a major way to present yourself to customers and prospects. For a more complete look at how to make your business card more effective, read the article Is Your Business Card Working for You? 1. Choose a design that is appropriate for the type of work that you do. 2. Make a list of information that you want to include on the card. 3. Choose the most important information. This should be shown in the largest, boldest print. In most instances this should include your name and business phone number. 4. Other contact information. Think carefully about the address and phone number (s). Some farriers find it necessary to allow clients to contact them at home, others prefer not to offer that option. Same with address; if you do a lot of billing and mail correspondence, then it is probably necessary to have the address on there. If you prefer to keep that info private, or if you forsee an address change then it should be omitted. Email - many farriers and their clients find this to be a useful (and non-invasive) method of correspondence. If you check your email regularly & don't intencd to change addresses, it should be on your business card as a way to reach you. Be aware that you will be held to the standard that you set for yourself. 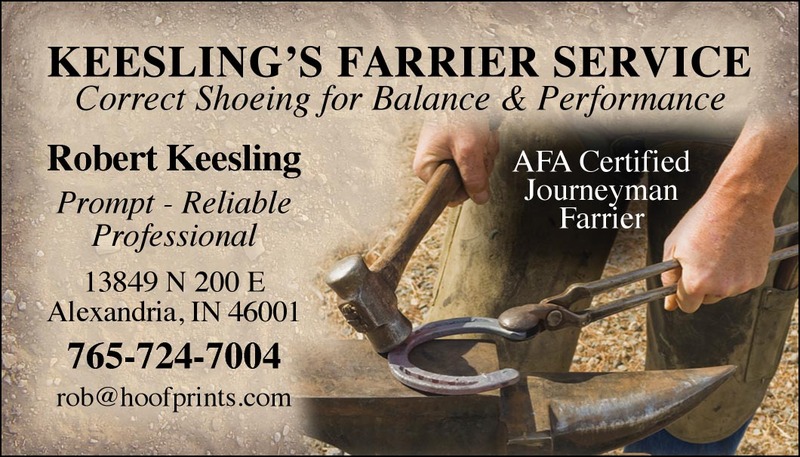 Stating that you do corrective or therapeutic shoeing invites that type of work, may also get you referrals from veterinarians. If you are new to the business, stating your education or degree of certification is a good place to start. If you choose to put promt and reliable, be prepared to act in that manner. 6. Optional back print. Many farriers use this area to write the next appointment. If you have policies regarding scheduling, payment etc., you may want to include them on your card. The back is also a good place for a humorous or uplifting quote or verse. Be sure and give the author credit. If you don't know the author, put author unknown -- not doing so implies that you wrote it. If you have your own logo, that can be printed on the back in black ink only. This can help to coordinate your new cards with other forms you may already be using. Optional back print is $12.00 per box.